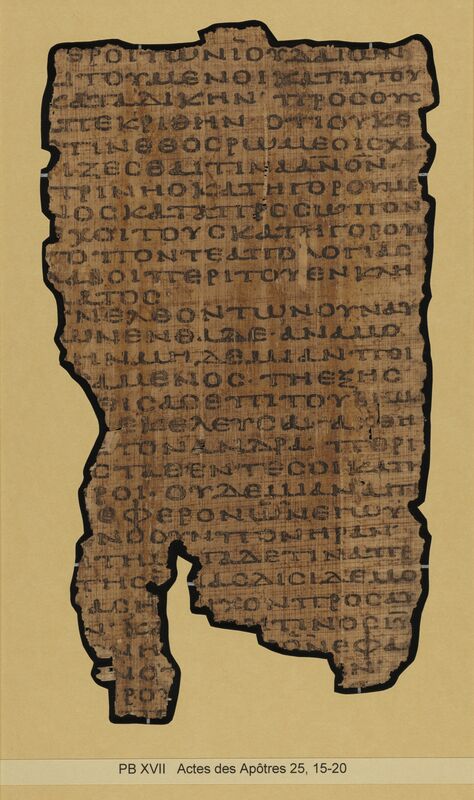 Description: This papyrus codex originally contained Acts and the Catholic epistles bound in a decorated leather cover. 124 of the original 132 leaves have survived, but many of them are highly fragmentary. 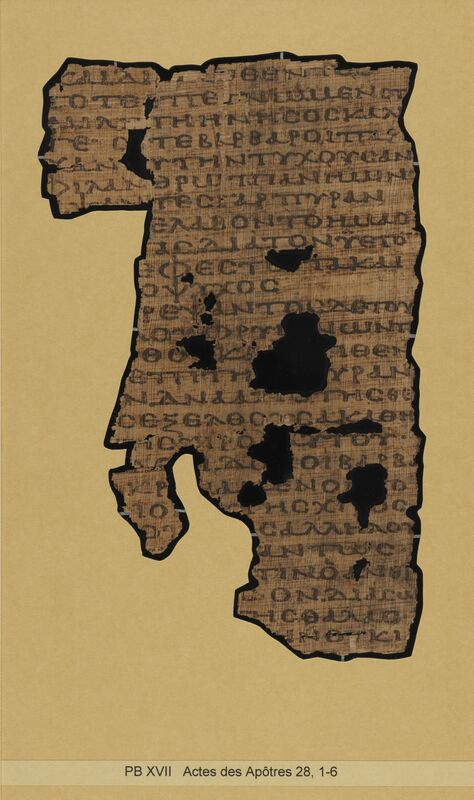 Kasser provides no detailed information about the acquisition of P.Bodmer 17 but dissociates it from the “Bodmer papyri” proper on the basis of its physical difference from the other codices. It was purchased prior to 1961. 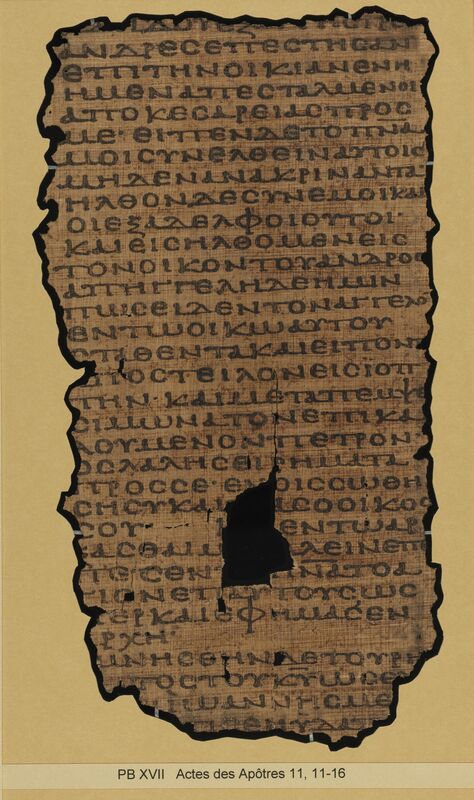 Dimensions: The estimated width of the page is 20 cm. The estimated height of the page is 32 cm. The estimate ratio of the page (width/height) is 0.625. The width of the written area of the page varies between 13.0 cm and 14.5 cm. The height of the written area fo the page varies between 25.0 cm and 26.0 cm. There are about 33 lines per page. Quires: According to Kasser, the codex was formed of 17 quires: 16 quires of 4 sheets (16 pages) and a final quire of 2 sheets (8 pages). The sheets are arranged so that horizontal fibers (→) face horizontal fibers and vertical fibers (↓) face vertical fibers. Cover: The leaves were bound in a limp leather cover. Its exterior was decorated with a pressed cross pattern. A textile spine strip is visible on the inside of the cover, along with what appears to be the remains of a parchment stay. The remains of the cover suggest that the original size of the folia was about 20 cm in width and 32 cm in height. Binding: According to Kasser, there is insufficient data to judge the exact structure of the binding. 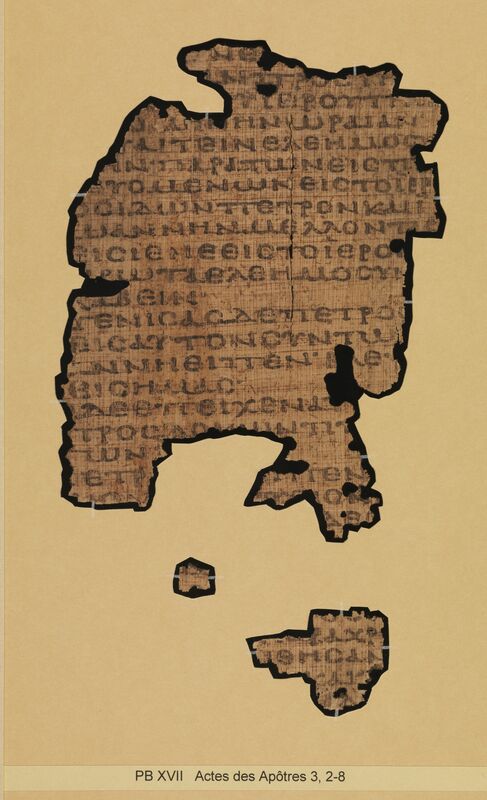 He reports the remains of a thread about 1 mm in diameter and a deteriorated parchment stay. Remarques généralesParatextual features:Sense breaks that often correspond to modern versification are indicated by spacing. The copyist employs the high dot and apostrophe. Rough breathings are indicated with a horizontal bar. Decorations: No decorations are visible in the text (but see the description of the cover). Kasser, Rodolphe. Papyrus Bodmer XVII: Actes des Apôtres: Epîtres de Jacques, Pierre, Jean et Jude. Cologny-Geneva: Bibliotheca Bodmeriana, 1961.